There are 500 three-speed bikes on the street at a total of 67 locations. A few more locations are expected in the coming weeks. Bikes are available from Temple's campus in the North to Point Breeze in the South and from Old City in the East to Clark Park in the West. Here is a neighborhood-by-neighborhood guide to all of the Indego Philly Bike Share locations. Thirty-three percent of the rides during the first week of Indego Philly Bike Share were taken by walk-up customers, who paid $4 per half-hour using a credit card at the kiosks. The remainder of the rides were taken by members. There are about 2,400 Indego Philly Bike Share members. 1,600 of them use the Indego30 membership and 800 use the IndegoFlex membership. The most popular stations during the first week were as follows, in this order: Rittenhouse Square; City Hall/Municipal Services Building; 15th and Spruce streets; Philadelphia Museum of Art; and 23rd and South streets. Indego30 members pay $15 each month for unlimited one-hour trips. After a trip extends beyond an hour, Indego30 members pay $4 per additional hour. IndegoFlex membership costs $10 per year and entitles members to $4-per-hour trips, as opposed to the $4-per-half-hour walkup option. A cash membership option is also available. Bikes include front and side baskets, although one staffer left his blazer in the side basket when he returned a bike to the Art Museum. Fortunately, it was still there when he went back. Each bike is also outfitted with splash and chain guards, an easily adjustable seat, and pedal-powered lights, in addition to sturdy tires and front and rear brakes, of course. Still not a member of Indego Philly Bike Share? Sign up here. INDIANAPOLIS - Indianapolis Cultural Trail, Inc. today celebrated the one year anniversary of the Pacers Bikeshare program with a public birthday party outside of Banker’s Life Fieldhouse. and announced the ridership numbers for the first year. First year milestones include 108,049 trips on the gold bikes which equate to 218,259 miles, or almost 9 times around the globe. 1636 Annual Members were responsible for 44% of the first year trips. Collectively, all of the bikesahre trips in the past year resulted in riders burning almost 9 million calories and taking more then 206,000 pounds of carbon dioxide out of the atmosphere. Pacers Bikeshare operating hours will be extended for the summer months making the active transportation option even more accessible. Bikes will be available from 5:00 a.m. to 3:00 a.m. through Labor Day weekend. A new, “Indy Welcomes All” blue bike was also unveiled at the celebration. People who find and ride the blue bike are encouraged to take a photo and post it to social media using the hashtags #IndyBlueBike. Winning photo will be selected weekly through May 31st. BCycle, which develops and delivers best-in-class bike share systems worldwide, announced today that its proprietary system helped set several usage records for the first and only bike share program in the United States to be funded through university student fees. BCycle developed new MFRID technology for Great Rides Bike Share, and worked with NDSU to create a software solution that allows students to use their Bison Card student IDs to access the system with a click of the mouse or tap of the screen. Great Rides Bike Share is the newest member of the BCycle bike share family. BCycle systems are located in more than 40 cities and municipalities in the United States and South America. BCycle’s unique non-profit operations model requires a collaborative approach. In Fargo, the city and university agreed to bring a bike share program to the community that would incorporate the school. They invited the non-profit Great Rides and other community members to provide input and selected BCycle as the bike share system provider. “We thought we were creating a transportation model, but in many ways, we’re seeing a recreational model emerge. It’s exhilarating to see college students pedaling for the pure joy of riding,” said Tom Smith, steering committee member of Great Rides Bike Share, owner of Great Northern Bicycle Co. and cycling advocate. Bike Share Great Rides’s system includes 101 bicycles throughout 11 station locations in downtown Fargo and NDSU’s main and downtown campuses. The university and its students fund 30 percent of the system with the remaining 70 percent of capital funding coming from other sources and sponsorships. Ever since Washington, D.C., launched the nation’s first publicly funded bike share program in 2008, some 70 cities have followed suit, from Savannah to Seattle. And while some systems have floundered financially—even D.C.’s original SmartBike system shut down in 2011 before its current Capital Bikeshare took off—bike sharing in the U.S. is clearly on a roll. More than a dozen new networks launched in 2014, up from just four in 2010. But Philadelphia will put a new spin on bike share this spring with the launch of its new Indego program in April. In a departure from other bike share programs around the country, fully a third of the 600 bikes in Philadelphia’s Indego system, with stations made by BCycle, will be located in low-income neighborhoods, and all residents will have the option of paying with cash if they don't own a credit card. "We’re blazing some trails," says the city’s bicycle programs manager Aaron Ritz. "We hope that this will be groundbreaking in a repeatable way." Despite their increasing success, one area where bike share programs have largely failed is in attracting a diverse ridership. As a rule, bike share users tend to be white, at least middle class, and more often male than female. Even in D.C, where half the residents are black, only 3% of its riders are black, according to a 2013 report on the program. In Boston, which launched its Hubway system in 2011, 80% of riders earn more than the city’s median income of $49,000. New York, which now has nearly 6,000 Citibikes in Manhattan and Brooklyn, has none stationed in the poorest minority neighborhoods. Considering that most bike share programs are funded at least in part with public funds, such stark lack of diversity is particularly problematic. Philadelphia, for example, is paying for its Indego bike share with $3 million in city funds and $1.5 million from the state. The rest of the program’s $16 million total budget over the next five years comes from a corporate sponsor (Independence Blue Cross) and a nonprofit family foundation. "You can’t just have a lifestyle amenity that is funded by public resources," says Adonia Lugo, a bicycle anthropologist at Bicicultures, an interdisciplinary research collaboration. That’s why Philadelphia decided to design its bike share system, slated to launch on April 23, to appeal not just to tourists and wealthy residents, but to a larger slice of its nearly 1.6 million residents. That includes the 27% who live below the poverty line and the city’s majority minority population, which is 43% black, 12% Latino, and 6% Asian. "Our bike share will be accessible to underserved communities from day one," says Carniesha Fenwick-Kwashie, grant manager of the Mayor’s Fund for Philadelphia. A $3 million grant from the JPB Foundation is paying for stations in low-income neighborhoods where the median household income is 150% of the poverty line. While bike stations in poorer areas may not be as profitable as those near tourist attractions like the Liberty Bell or the Rocky Steps, "It was important for us to put the bikes not only in areas that would be a slam-dunk revenue generator," says Ritz. What’s more, Philly will be the first U.S. city to launch its bike share with a cash payment option available to any resident, regardless of income. (While Boston’s Hubway and Capital Bikeshare also have cash payment options, Boston's is only allowed for residents under a certain income threshold and D.C.'s only for residents of certain areas.) They will need access to a computer and a permanent address to sign up for the 30-day membership, which costs $15 and includes an unlimited number of free one-hour rides. They will receive a key fob in the mail giving them access to the system, and can fund their account at 7-Eleven or Family Dollar stores. An annual Indego membership costs $10 plus $4 per ride, and nonmembers can pay $4 per half hour. The big question going forward is whether Philly’s efforts to build a better bike share will actually work. "What makes bicycling accessible for people is feeling a sense of belonging or seeing people who look like them riding," says Lugo. Because many low-income people grew up riding public transit, "riding bicycles can be seen as a failure," adds Alison Cohen of Bicycle Transit, which will operate Philly’s network of bikes and stations. To get the word out, the city is hiring 10 neighborhood "ambassadors" to show residents how to use the bike share and encourage them to do so. It has also teamed up with the Mural Arts Program to create public murals designed by local artists with help from local elementary schoolkids in low-income areas that will draw attention to the stations. A social media campaign called "Where Will Indego Take You?" will ask riders to take pictures of rides to their favorite parts of the city and share them on Facebook, Instagram, and other social media. Philadelphia’s ambitions don’t end at its city limits, either. It’s teaming up with Drexel University's School of Public Health to study the impacts of bike share on riders’ health over the next three years. And it is working with the national nonprofit People for Bikes to help other cities develop more inclusive systems and transform bike share’s image from a luxury for the rich into an affordable, healthy, and fun alternative for more city dwellers. Launched just over a year ago in December 2013, the popular bike share platform has seen two record setting spring seasons during the festivities of SXSW. In 2014, Austin B-cycle set a record 6.2 average of checkouts per b-cycle per day and a one-day record of 10.1 checkouts per b-cycle per day. During the 2015 conference, a record 3,032 total trips were taken in one day on Thursday, March 19th, averaging 8.2 trips per ​B-cycle. From March 13th - March 22nd, the Austin B-cycle team manned 9 valet stations and balanced the system nearly 7,000 times to account for the influx of trips made to the central business district, primarily the Austin Convention Center. Throughout the 10 days of SXSW, attendees and visitors of Austin took over 21,000+ trips - nearly 4,000 more trips than B-cycle's inaugural SXSW in 2014! Waterloo, Wisconsin – April 1, 2015 – As the dust settles over Austin with SXSW 2015 in the books, Austin prepares for the 2016 installation of its famous multimedia festival and exhibition. Brian Conger, Director of Operations at BCycle, was pleased to announce the launch of a new product to the bike line, BUniCycle, to satisfy the increased demand placed on bike-share systems during events like SXSW. Oh, and, Happy April Fools’ Day! Now that the weather is changing, it might be time for a bike ride, and it looks like Cincinnati Red Bike had a good year, even through the colder months. Red Bike underwent a small expansion to get ready for the spring rush at Fourth and Vine streets on Thursday. According to Red Bike executive director Jason Barron, Red Bike is red hot. "So far people are excited about it. Red Bike has been really popular; people have been using it. It’s a nice new thing in downtown," Barron said. The bike sharing program launched in September with winter on the horizon. According to the numbers, other than the most snowy parts of February, Red Bike more than survived the winter. "We had 2,000 riders in December and 1,800 in January. You know the last couple weeks were a little snowy, but people were still out riding even on the worst days," Barron said. The program worked well for bike enthusiast Frank Henson. He now leaves his own bike home when commuting from Madisonville. "If you've got eight to 10 blocks to walk, you're going to be just as cold. But when you're on the bike, you get it over quicker," Henson said. "I used to put my personal bike on the front of the bus and come downtown on the bus, get off at a Red Bike station, get on a Red Bike and go." Henson said he thinks people will find that the program is as easy as riding a bike.
" It's pretty intuitive. You get on the bike, you ride it where you need to go and you check it back in," Henson said. Along with expansion this summer in Northern Kentucky, there will also be more locations popping in the Cincinnati area. Red Bike hopes to have the expansion done in time for the All Star Game. 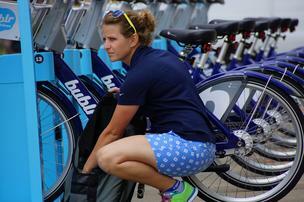 The team at Bublr Bikes has begun distributing 70 blue two-wheelers to 10 rental stations around the city, preparing to launch the bike-share system's second year on Monday. Bublr Bikes launched in Milwaukee in August of 2014, and provided a transportation alternative, primarily in the downtown area. The launch put Milwaukee on pace with all but a few other major cities in the U.S. that provide short-term bike rental systems. With a few months' experience the system revamped its pricing structure for 2015, and will begin to expand into neighborhoods. Targets for 2015 include Bay View, King Drive, Brady Street and the Menomonee Valley, and the build out will be guided by public input gathered through meetings over the next several months, according to Kevin Hardman, executive director. "The goal is to have 40 stations," Hardman said. "There's a lot of heavy lifting for us to make that goal." Hardman is especially excited about a simpler pricing format designed to encourage more people to try the distinctive bikes produced by a Trek subsidiary, B-Cycle. For walk-up users, the bike rentals will cost $3 for every 30 minutes of use. Monthly passes will cost $15 and include unlimited rentals for 60 minutes or less. If a monthly pass holder keeps the bike for more than 60 minutes, the $3 for every 30 minutes charge will apply. For more details, click here. In 2014, users paid a $7 access charge that included the first 30 minutes of rental time. It was too confusing and expensive, particularly for people just trying out a Bublr Bike, Hardman said. "What we did last year was hugely helpful to understand how to run a great system," Hardman said. The bikes proved popular for commuters who traveled to Milwaukee by train, then pedaled to jobs at ManpowerGroup Inc. and offices in Schlitz Park. Tourists looking to travel between downtown attractions also put the bikes to good use, Hardman said. "Cities are successful when there's a whole range of transportation choices," he said. "It needs to be a convenient and easy choice." Bublr Bikes is a not-for-profit business started to create the bike-share system. The launch has been financed through $1.2 million in sponsorships and donations, $3.1 million in federal grants and $300,000 in city dollars generated through a tax-incremental finance district. To reach the 5-year goal of 800 rental bikes at 100 stations across the city, Bublr Bikes projects it will need to generate $5.3 million from user fees and $3.7 million in donations, sponsorship and advertising. Instead of driving from place to place in Downtown Fargo, some are choosing to ride, and that's being made easier for everyone. Today Great Rides Fargo launched their bike share program. There are 11 stations with over 100 bikes in the metro including some on NDSU's campus. The bikes can be borrowed for 30 minutes at a time to encourage sharing. A day pass costs $6. The program has been in the works for three years and is finally up and running. Sara Watson Curry/Great Rides Fargo, "Healthy transportation has been a huge conversation in our community and so, I think this is going to open up people's eyes for a lot of options to hop on their bike on their lunch break or hop on their bike and head on down to the Y and work out there." Passes are $15 a month and $75 for a year. NDSU students are able to sign up for free. Madison B-cycle, the city’s bike sharing system, saw record ridership in 2014. According to Madison B-cycle’s 2014 Annual Report, out today, ridership increased by 28% over 2013. B-cycle closed their fourth season with 104,274 total trips and 39 stations in operation. More than 315 signature red bikes covered over 219,000 miles throughout the city from March 20 through December 11, 2014. Read the full 2014 Madison B-cycle Annual Report here. In partnership with UW Health, UW Credit Union and Krupp General Contractors, Madison B-cycle added four new stations to the bike sharing system in 2014. The new stations connect the existing network to the near-west side of Madison, including locations at UW Health facilities and the UW Credit Union. Madison B-cycle will reopen in March 2015 following their winter closure. Last week, Bikesantiago installed B-cycle's largest station to date (31 docks) at the base of Costanera Center, the tallest building in South America. Attendees at the inauguration of the system launching in Providencia - one of Santiago's hippest and most bike friendly communities - included the Metropolitan Mayor, the Mayor of Providencia and Chile's Banco Itaú Regional Manager. High standard bikes, automated stations, accident insurance, extended hours, GPS monitoring and access to the most modern intercommunity network of sustainable transportation in South America are some of the benefits that complement the new public bike system for Providencia, which was presented today by the Mayor Josefa Errázuriz. Bikesantiago will launch in Providencia on December 10 with 180 bikes and 18 stations, which will be progressively extended to complete 600 bicycles and 40 stations during 2015. This is a strong impetus to sustainable mobility for the community of Providencia beginning on December 10, when the new public bike system begins operation, a modern service will be integrated with 13 other communities of the Metropolitan Region and will allow its users to access the high standard bicycles, save time and money on the road, improve their quality of life, care for the environment and contribute to the decongestion of automobile traffic in the city. This important change was announced by the Mayor of Providencia, Josefa Errazuriz, together with Alejandro Powell, CEO of Bcycle Latam, operator of Bikesantiago; and Boris Buvinic, General Manager of Banco Itaú, sponsor of Bikesantiago, who presented the first station that is implemented in the community, located at the Costanera Center mall, steps from the Tobalaba subway station. "From Providencia we want to build a better coexistence and contribute to a more sustainable society, with healthier citizens. And this only is possible if we favor public transport, pedestrians and the bicycle”, said Mayor Josefa Errázuriz, proposing the need to think about these kinds of public policies at the Metropolitan level. "I am convinced that we need more inter-communal and metropolitan solutions, especially in regards to the direction of metropolitan transportation," said the community leader. The general manager of Banco Itaú, Boris Buvinic, added that being part of this project aims to "promote the bicycle as a means of sustainable transport for the benefit of the community, contributing to improve the quality of life and make a more friendly and less polluted city of Santiago. With the launch of today, Bikesantiago is consolidated as a system of intercommunity transport, open to all persons who wish to use it and to which we hope to add more and more communities". For his part, Alejandro Powell explained that Providencia joins the network of Bikesantiago which was inaugurated in October 2013 - already operating in Vitacura and Lo Barnechea - and ensures the same standard of quality and technology for all the inhabitants of the capital. "This is a public-private initiative that directly aims to deliver real benefit to all Santiagans, without distinction. We are convinced that riding a bike can positively change people's lives and with Bikesantiago all have at their reach the most efficient, safe, economical, and sustainable form of urban transport in the world. Together we are pedaling forward to help make the city that we desire a reality", stressed the CEO of Bcycle Latam. In its first phase the new public bike system of Providencia will launch with 180 bikes and 18 stations, which will increase in the coming months to reach 600 bicycles and 40 stations by May of 2015. In total, the system will have 2,100 bicycles and 200 automated, solar-powered stations. It will operate 365 days a year, from 6.30 a.m. to 11 pm, which implies an important improvement over the current system [of public bicycles], which only ran Monday through Friday until 9 p.m., and Saturdays until 2 p.m., leaving users no service on Sundays and public holidays. To use the service, it is not necessary to be a resident of Providencia: you only have to be 14 years of age or older to enroll at www.bikesantiago.cl, and opt for one of the available memberships starting at $4,990 Chilean Pesos a month. You can pay with a credit card from any bank, Rut or electronic transfer account, which includes a unique accident insurance and entitles you to unlimited travel, in lengths of up to 30 minutes each checkout. The bicycles are of high standard and are equipped with three gears, internal brakes, Kevlar tires, LED lights and real-time GPS monitoring. The communities of Vitacura, Lo Barnechea, Providencia, Ñuñoa, Santiago, Macul, San Joaquín, La Florida, Lo Prado, Estación Central, Recoleta, Independencia, San Miguel, and Maipú will be united during 2015 with inter-communal Bikesantiago public bikeshare system. The Mayor Josefa Errázuriz made an open invitation to those who live, study or work in Providencia "to utilize this new public bike system for a new perspective of the city and to contribute to the decongestion of our streets with a more sustainable transportation option and a healthier lifestyle". From left: Alejandro Powell - CEO of Bcycle LATAM; Claudio Orrego - Superintendent for the Metropolitan Region; Josefa Errázuriz - Mayor of Providencia; Álvaro Wrobbel -Regional Director of Banco Itaú Chile. From Boulder B-cycle's Twitter: The weight limit for B-cycle baskets is 20 pounds. That's a pretty big free-range t(of)urkey for Thanksgiving! B-cycle Sneak Peek in Dayton! Dayton Mayor Nan Whaley with a B-cycle bike. Yesterday the B-cycle demo team was in Dayton, OH for the Downtown Dayton Partnership Annual Meeting. The event showcased the great progress Dayton has made in recent years and the exciting things coming down the pipeline. In partnership with the Downtown Dayton Partnership, Bike Miami Valley, Greater Dayton RTA, and more, we offered a sneak peak of what is coming to Dayton in spring 2015. The demo station was set up, giving attendees a first-hand look and feel for the system. It was great seeing Dayton Mayor Nan Whaley and many great people from the Dayton community take a spin on the bikes. We’re looking forward to welcoming Dayton to the B-cycle family of more than 40 cities! A Successful Inaugural B-cycle World! We recently held our inaugural operators' conference, and it was a blast! B-cycle World 2014 brought together B-cycle operators and staff from around the country and Santiago, Chile to our headquarters in Wisconsin. The conference provided B-cycle staff the opportunity to announce new products and services and share best practices and tips for success. It also gave operators the chance to meet other operators, grow a stronger network with other B-cycle cities, and get face-to-face interaction with many on the B-cycle staff they email and call often. From the entire B-cycle staff, it was amazing meeting all of the operators and chatting over some Wisconsin beer. Congrats to JD Simpson from Austin B-cycle for winning the B-cycle trivia contest! As the above picture shows, we have a large family! The phenomenal growth of B-cycle since 2010 is a testament to our great operators. We look forward to putting on an even better B-cycle World for 2015! “Tough but not impossible.” That was one of Rodeo Adventure Labs initial thoughts when the idea came up to ‘B-cycle’ up the highest paved road in North America. The organization, which is dedicated to the celebration of the many reasons we ride bikes, took bike share to new heights – 14,265 feet to be exact – and conquered Mt. Evans in Colorado on Aug. 9. B-cycle is a 100% owned subsidiary of Trek which has experienced explosive growth since its birth in 2008. B-cycle began with its first system in Denver on April, 22, 2010 and today we are in 40 locations in North and South America. We are now seeking 2 experienced sales representatives to join this extremely dynamic team. The ideal candidate will be capable of presenting and interacting well in diverse environments and with diverse decision makers such as public advocates, public employees, transit agencies, and non-profit bike share system operators. He or she will be capable of managing a 3 to 5 year sales process. The ability to develop and nurture long term relationships is key to success in this position. B-cycle is a start-up with rapidly evolving structure and product. A high degree of flexibility and willingness to help wherever needed is required. These positions will be based in Waterloo, Wisconsin and come with full Trek Bicycle Corporation employee benefits. - Extensive travel, including International travel, is required. - Excellent interpersonal, writing, PowerPoint, and presentation skills are required. - Fluent Spanish is a plus. Milwaukee (Aug. 6, 2014) – Bublr Bikes has begun installing its first 10 Milwaukee bikeshare stations, and within a few weeks the public will be able to take out bikes to spin around the city, the group announced Wednesday. The 10 locations and the system’s new “Bublr Bikes” name were unveiled at a news conference Wednesday at a just-­completed Bublr station in Milwaukee County’s Red Arrow Park. The other new stations are currently being installed. They are expected to be stocked with new bikes and ready for riders in the next few weeks — in advance of the system’s full launch with up to 40 more staRons in 2015. Bublr Bikes offers bicycles that can be rented from automated kiosks and returned at any station. The initial rates will range from $7 per day to $20 per month for unlimited trips under 30 minutes each, with additional charges for longer trips. Users can buy day passes at the stations or purchase monthly passes via Bublr’s website, www.BublrBikes.com. The website offers more details on the system and sponsorship opportunities. Bruce Keyes, president and co-­founder of Milwaukee-based Midwest BikeShare Inc., the non-­profit that operates Bublr Bikes, said the opening of the first 10 stations later this month precedes the system’s planned launch next year. Keyes said an additional 25 to 35 stations with 200 to 300 bikes will be available next year. The system expects to grow to 100 stations with 1,000 bicycles within a few years, reaching more neighborhoods as funding becomes available, he said. !“ With these first stations, riders will be able to bike between many popular destinations this year and get a real sense of how the larger system will work in 2015 and in future years of growth,” Keyes said. ! Mayor Tom Barrec said bike sharing will offer residents, workers and visitors a new, environmentally friendly and healthy way to explore the city and neighboring communities. Midwest BikeShare Co-Founder Barry Mainwood praised both the “catalytic partnership” with the City of Milwaukee that helped get the project off the ground and the critical backing from the county, Wisconsin Department of Transportation and many private supporters. “The continued support of these partners will be vital as we roll out more Bublr Bikes in Milwaukee and beyond,” he said. Mainwood noted that Shorewood, Wauwatosa and West Allis are planning to install Bublr Bike stations in the future, which will make the system a regional asset. MGIC Chairman and CEO Curt Culver said his company was supporting Bublr Bikes because the system would benefit people who live and work downtown and would attract visitors, young talent and businesses to the city. “I encourage other Milwaukee employers to get behind Bublr Bikes and help make downtown and nearby neighborhoods even more exciting and vibrant,” he said. Kevin Hardman, launch director of Bublr Bikes, said Midwest BikeShare had raised nearly $3 million. More than $1 million of the funding came from over two dozen private donors, including the Mandel Group, MGIC, the Astor Street Foundation, The Pabst Theater Group, Schlitz Park, the US Bank Center, the Brico Fund, the Milwaukee Development CorporaRon, Lakefront Brewery, the Greater Milwaukee Foundation, Dermond Property Investments,Rockwell Automation and others. A full list of sponsors can be found at http://bublrbikes.com/support/sponsors/. Hardman said that an additional $3 million needs to be raised to achieve the goal of a 1,000-­bike network within a few years. “We greatly appreciate the leadership of these private sponsors and urge other private sponsors to join us in bringing bike sharing to the people of Milwaukee,” Hardman said. Midwest BikeShare Board Member Juli Kaufmann said that as it plans future stations, Bublr Bikes is working with neighborhood groups and leaders to ensure the system is accessible to as many Milwaukee residents as possible. Future locations for stations will include traditionally lower-­‐ access parts of the city, Kaufmann said. “We’re commiced to making this a bike system for everyone,” Kaufmann said. The addition of new stations follows the success of a demonstration kiosk installed last year outside Discovery World. With no marketing or other stations to bike to, the Discovery World station generated nearly 1,000 rides last season. Bike share programs already operate in dozens of U.S. cities, including Chicago, Denver, Des Moines, Houston, Indianapolis, Madison, Minneapolis, New York City and Omaha. Hardman said the system’s new “fun, playful name was inspired by a quirky bit of Milwaukee lingo and invokes our locaRon on one of the Great Lakes and several major rivers.” “Bubbler” is a common Milwaukee term for drinking fountain. “Bublr Bikes is an attractive, ear-catching, eye-­grabbing name that will stand out and be easily recognizable and enjoyable to residents and visitors,” Hardman said. Bublr Bikes will announce when all 10 stations are operating and will notify the community through social media as each new station goes on line. Information on using Bublr Bikes and becoming a supporter of the system is available at BublrBikes.com. Bublr Bikes is on social media at: http://facebook.com/BublrBikes and https://twitter.com/BublrBikes. Bublr Bikes are a fun, convenient and healthy way to travel around Milwaukee. The system is developed and managed by Midwest BikeShare Inc., a Milwaukee-based 501(c)3 not-for-profit organiza7on, in collabora7on with a wide range of public and private partners, including the City of Milwaukee. INDIANAPOLIS - Indianapolis Cultural Trail, Inc. today officially opened the Indiana Pacers Bikeshare program with 250 bikes and 25 stations located primarily on or near the Indianapolis Cultural Trail: A Legacy of Gene and Marilyn Glick in downtown Indianapolis. Bikesharing is a healthy transportation option designed for short trips. Bikes are available by purchasing either an annual membership for $80 at pacersbikeshare.org or a 24 hour pass for $8 is available online or at a bikeshare station kiosk. Your pass or membership gives you access to a bike for unlimited thirty minute trips. Trips over thirty minutes will incur additional user fees as is standard with bikeshare programs around the country. Pacers Bikeshare annual members will be able to track how many miles they ride as well as see how many calories they have burned while using bikeshare. Bikes will be available from 5:00am to midnight, 365 days a year. The bikes are made by Trek Bicycle and the system equipment is provided by B-Cycle, LLC, which has implemented bikeshare systems in more then 30 cities. The public is invited to attend a Pacers Bikeshare celebration in the west plaza of City Market from 4:30 - 6:30 pm this evening. Indianapolis Cultural Trail, Inc. ensures that the Indianapolis Cultural Trail: A Legacy of Gene and Marilyn Glick is a beautifully maintained and vibrant community asset that connects people and places in downtown Indianapolis. Indiana Pacers Bikeshare is a program of Indianapolis Cultural Trail, Inc. Learn more at IndyCulturalTrail.org andPacersBikeshare.org.